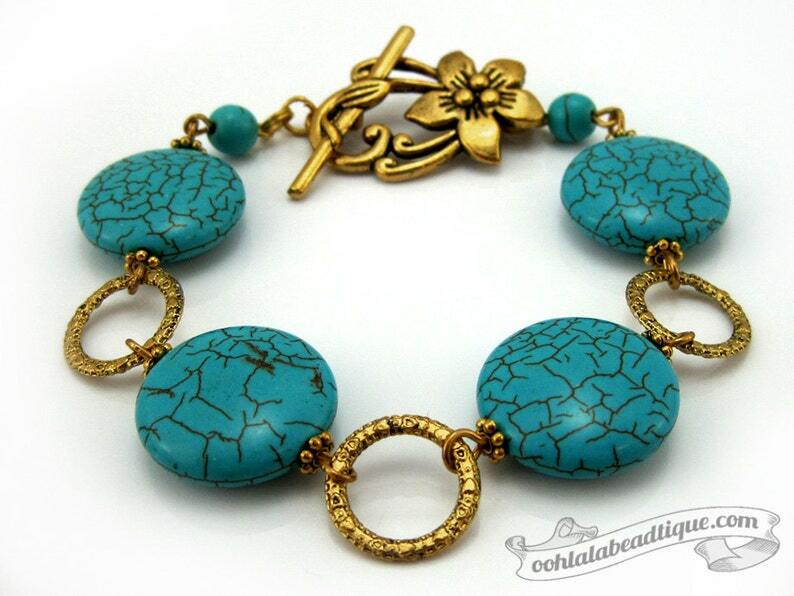 Yellow gold highlights the turquoise of this bold ladies handmade Turquoise Magnesite bracelet. Button shaped Turquoise Magnesite, and gold plated Tibet silver are combined together for a stylish look. The bracelet is strung onto gold plated wire for strength, durability and drape. Finished off with an ornamental lotus flower shaped toggle clasp. The Turquoise Bracelet is approximately 7.75 inches including the clasp. It will best fit wrists measuring 7.25 to 8.25 inches. Magnesite is thought to have a calming and relaxing effect. It brings resilience and patience as well as promoting a positive attitude towards life. It assists in awakening the mind to communication from the heart. 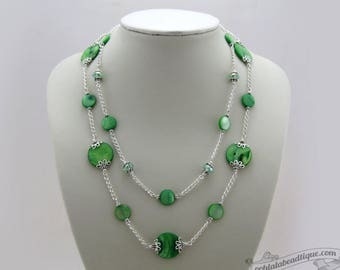 It may be due to the high magnesium content that Magnesite is said to aid both the emotional and physical bodies in “relaxing and releasing” stored tension or stagnation. Magnesite helps to relieve muscle spasms and chronic muscular tension caused by stress. The stone also enhances brain function, soothe sensitive skin and heal fibroid tumors. Magnesite is a birthstone for the Zodiac sign of Aquarius. Many Ooh-la-la Beadtique handmade products are crafted using natural components such as semiprecious stones, freshwater pearls, and wood. No two materials in nature are alike. The Turquoise Bracelet that you will receive may slightly vary in shade and texture pattern from the picture listing. Also note, that all monitors and computer screens are calibrated differently. The same product may appear in diverse colors on different monitors.